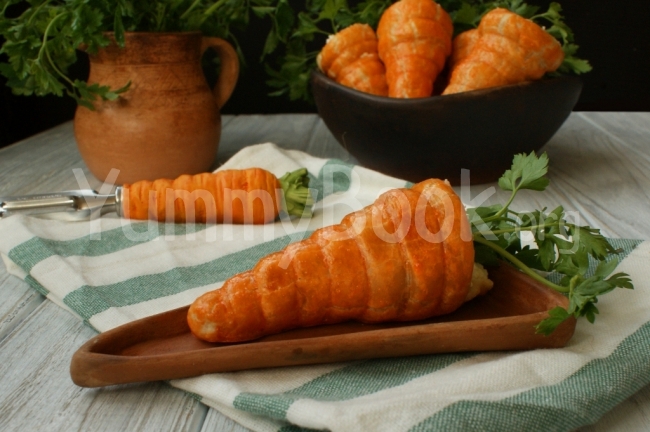 Puff Pastry Carrots is a very beautiful and tasty dish. It is suitable both for Easter and for everyday meal. Leave the puff pastry dough on the counter for an hour or two for defrosting, then lightly roll the dough, cut into strips 1-1.5 cm wide and coat with beaten egg. Fold each strip in half along the entire length and slightly roll. Wrap each strip spirally around a metal horn, starting from the narrow part. Add an orange food coloring to the beaten egg left after coating the dough. Coat each carrot with orange colouring and bake in preheated oven at 200 C degrees for 20 minutes. Let the carrots cool completely. For the filling mix the cottage cheese, chopped garlic, salt, pepper and chopped fresh herbs. Mix and stuff each "carrot". You can also stuff carrots with any other salad you like.